The lab of carbene pioneer Guy Bertrand recently unveiled a novel homogeneous hydroamination involving ammonia (Lavallo et al. DOI). 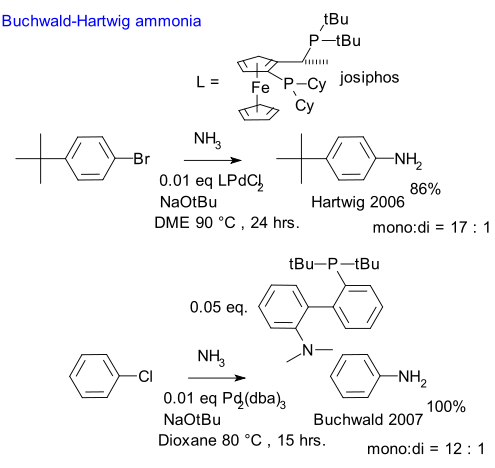 Cheap ammonia is a common reagent in organic chemistry (take nucleophilic substitution of alkyl halides) and the first reported heterogeneous (not homogeneous) hydroamination (reaction of ethylene with ammonia and sodium metal) dates back to 1954 (Howk et al. DOI), patents not included. Homogeneous reactions but not hydroaminations have been reported by Hartwig in 2006 (Shen et al. DOI) and by Buchwald (Surry et al. DOI) in 2007 as extensions of the Buchwald-Hartwig reaction. In the novel system the substrate is an alkyne such as 3-hexyne and the complex catalyst is based on a N-heterocyclic carbene called CAAC (cyclic alkyl amino carbene) coordinated to gold(I) with a toluene ligand and tetraphenylborate counterion. 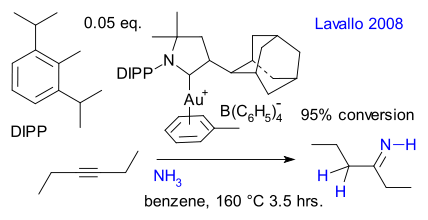 The reaction product is the corresponding imine. Update November 2008: More ammonia chemistry with a novel conversion of benzyl alcohol to benzylamine in a single step using a ruthenium hydride as reported by Gunanathan and Milstein (DOI).